Yesterday, the Giants beat up on the Falcons. I'm so happy they did. 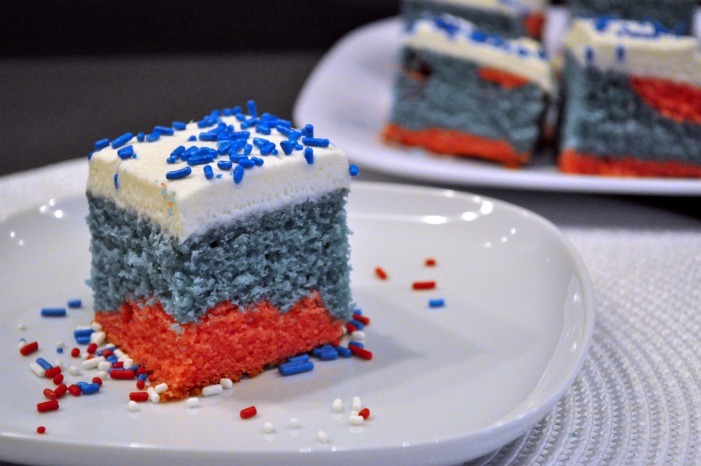 Because, you see, I made a blue and red cake for my G-men. That's how I celebrate. With cake. And if they did not, in fact, beat up on the Falcons, I would feel majorly slightly embarassed to share this cake with you. It's pretty. And yummy. And the reason that I'm 20 lbs. overweight. Let's pretend that doesn't exist for today. Because this cake is so soft and fluffy. It's topped with sweet vanilla buttercream. And I actually got the cake color right on this one. Very unlike my Jets cake of yore. Yikes. I'm glad that we were invited to our friends John & Laura's party for the game so that I could redeem myself with this! 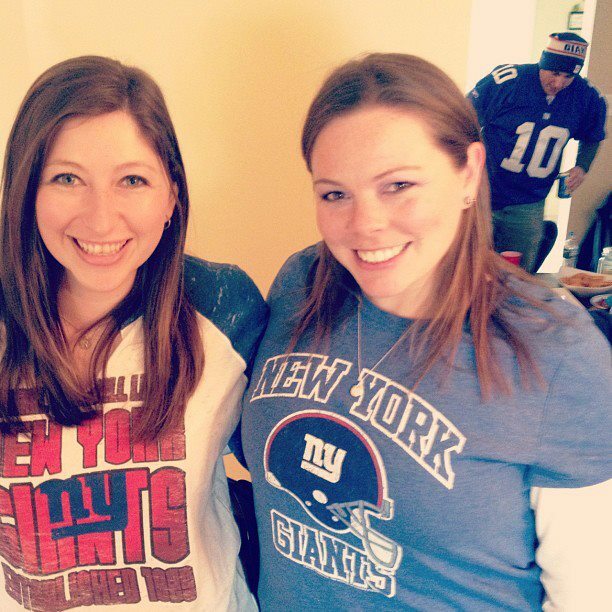 Plus I got to see my friend Kristen whom I've not seen in quite a while and celebrate in our Giants gear. But back to the cake. After mixing in a heckuva lotta food coloring, I layered the cake batter into a long pan. It swirled on its own. Purdy. If you (gasp) are not in fact a Giants fan, you could easily adapt this cake to fit your own team or holiday or anything you want, really! Heat oven to 350°F. Coat a 13x9" pan with baking spray with flour (make sure it's with flour!) Set aside. In a mixing bowl, whisk together the cake flour, baking powder, salt and baking soda. Beat butter and sugar in a stand mixer or with an electric hand mixer until fluffy. Beat in eggs, milk and 1 1/2 teaspoons vanilla on medium speed until blended, scraping bowl. Gradually add flour mixture, beating until just blended. Separate batter in half, adding red food coloring to one and blue to the other, mixing each one well (Note: I mixed each one separately in my mixer, cleaning it out in between mixes). Spread the red batter evenly in the pan. Top with blue batter and carefully spread. Bake for 19-23 minutes or until a toothpick comes out clean. The batter will naturally swirl together in the baking process. Cool in the pan for 10 minutes, then transfer to a wire rack to finish cooling. Now, make the frosting. Beat the butter until fluffy. Add the confectioners' sugar, 1/2 C at a time until completely combined. Add milk as necessary to thin out. Beat in the vanilla extract. Mix on high speed for a few minutes until the frosting is light and fluffy. Spread over the top of the cake (carefully!). Sprinkle with sprinkles. Cut into bars. I really love this cake. It's going into my permanent collection as a base white cake. Yum. What's your favorite kind of cake? I love chocolate with vanilla buttercream! Have you ever made a sports-themed food? I've made a (failed) Jets cake and Giants & Jets popcorn mixes!